Our customers wanted more power to perform all functions at once. They wanted a heavy-duty stake-down system for greater stability when boring and backreaming. They wanted greater horsepower, a higher-capacity pump, advanced electronics—and, of course, they wanted all of it to be easy to operate. 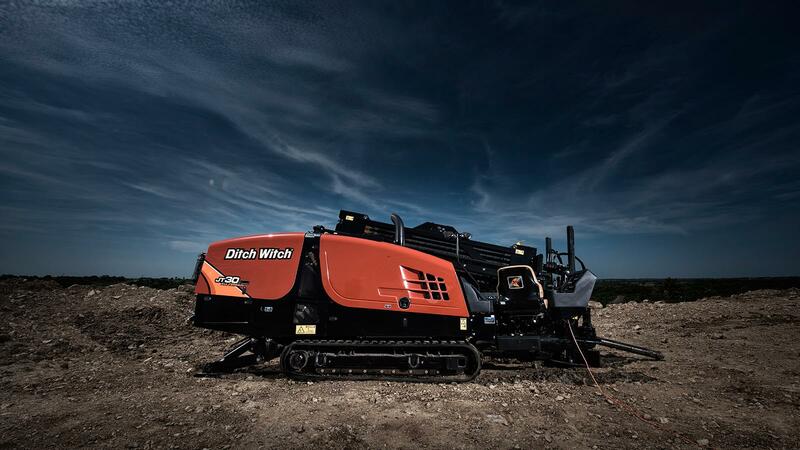 Our engineers love a challenge, and you'll love the JT30 All Terrain directional drill. 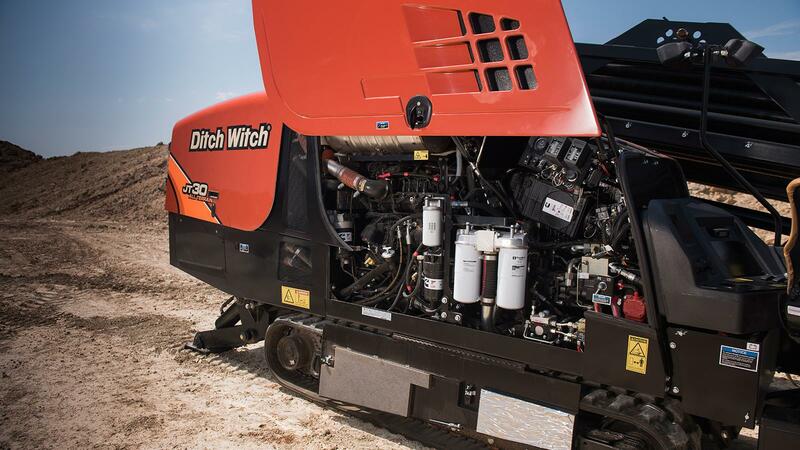 160-gross-hp (119-kW), Tier 4 engine is the most powerful in its class; full power to all machine functions greatly enhances your overall productivity. Equipped with 24,800 lb (110 kN) of thrust and 30,000 lb (133 kN) of pullback force for efficient installation in tough soils. Quietest directional drill in its class (max. 85 dBA operator sound pressure), so there’s less environmental impact, less disruption in urban areas, and greater operator comfort. 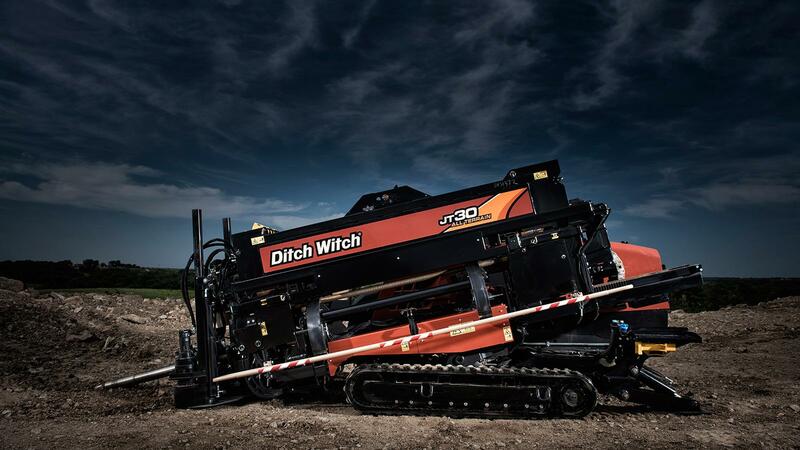 With a narrower width (80 inches/2 m, w/o cab) than the competition, the JT30 All Terrain is a higher-horsepower drill that can operate in tighter spaces. Advanced electronic system features improved diagnostics and customer-recommended electronic functions. 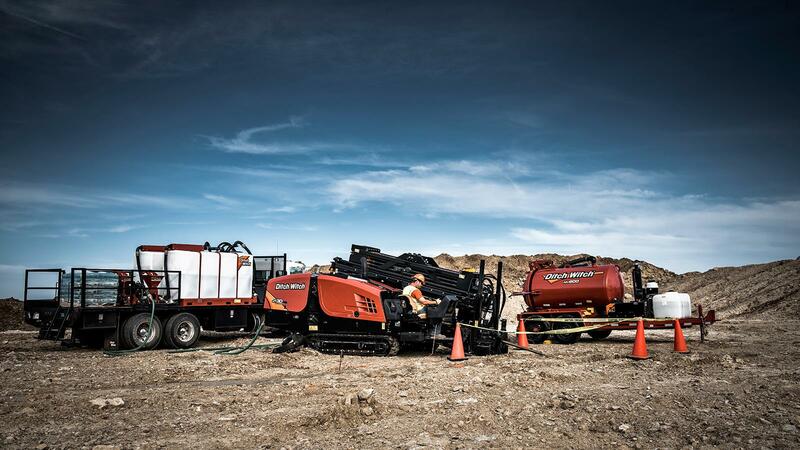 Exclusive assisted makeup and breakout feature: JT30 All Terrain automatically adjusts carriage thrust speed when making up and breaking out drill pipe, saving wear on pipe threads and reducing operator fatigue. 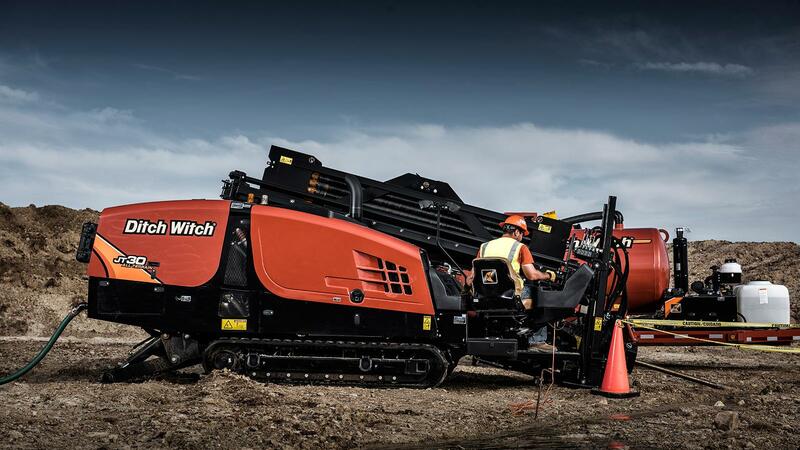 Automatic, intuitive carve mode reduces operator fatigue and error and is compatible with industry-leading TriHawk HD housings and bits for exceptional efficiency and productivity. Field-proven, heavy-duty rack and pinion thrust drive; welded-on double rack offers minimum maintenance and maximum reliability. 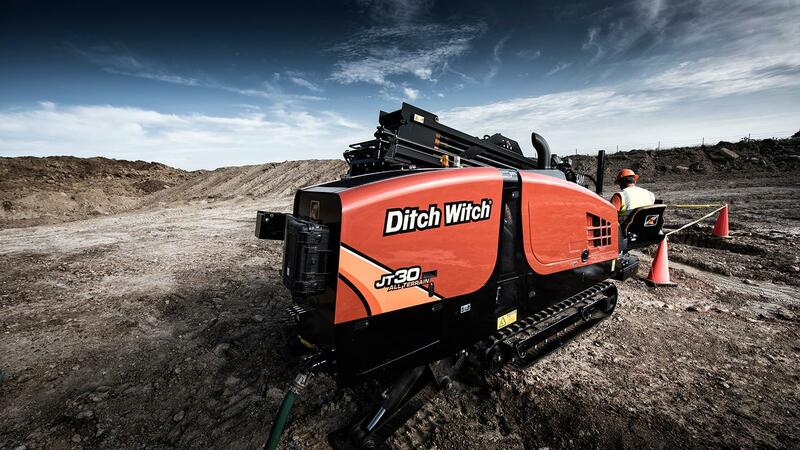 Patented Ditch Witch All Terrain technology features the industry’s most advanced inner-rod design, proven to increase mud flow and power. 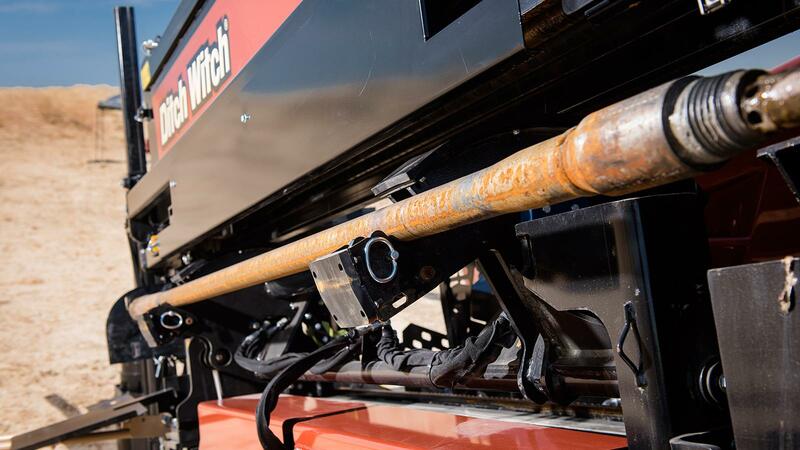 Industry-exclusive, double-pivot drill frame allows steep entry angles without raising the tracks off the ground—no need to constantly readjust the machine even when the terrain is muddy or steep; enhances operator comfort because operator’s station stays level. Optional cab features climate-controlled heat and air, for greater operator comfort and productivity. 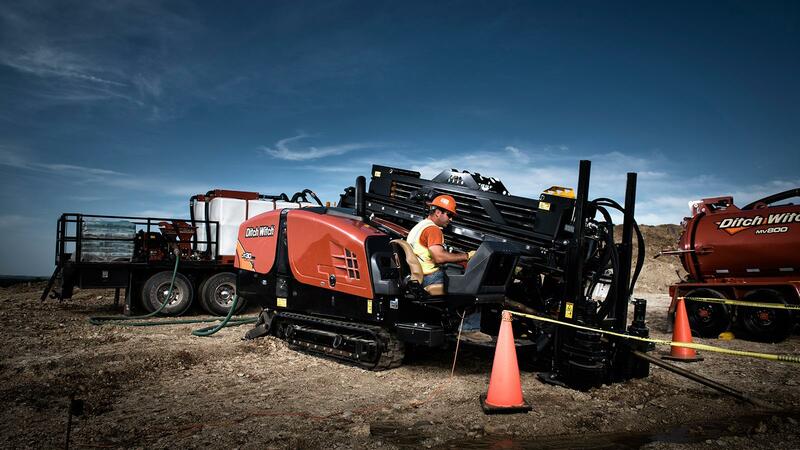 Visibility enhanced by open-top vise wrenches and improved operator's station; wrenches are angled toward the drill operator for an excellent view of the tool joint when making and breaking pipe, and all drill functions are clearly visible from operator station, with or without cab. Hinges on main and rear hoods allow easy access to all service points in the engine and mud pump; rear mud pump cover allows you to operate in colder conditions. 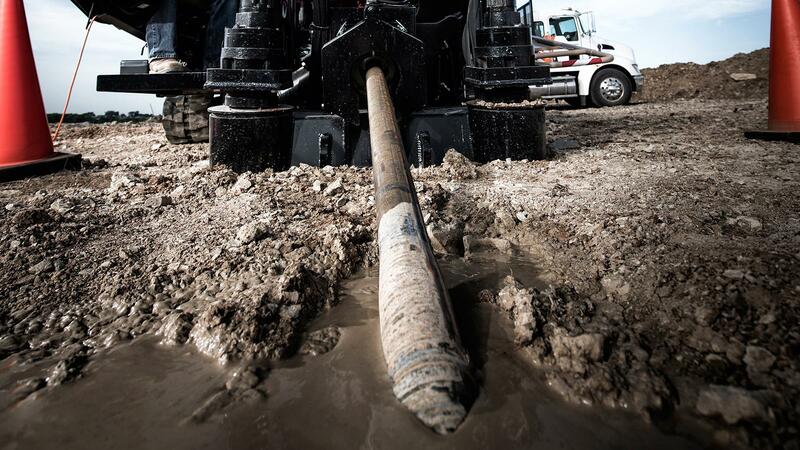 Heavy-duty anchor system enables you to stake down the JT30 All Terrain in solid rock and push or pull with full machine thrust; better machine stability while drilling means a quick and more productive bore.